If you're eager for the thrills and adventure of crime fighting but don't like the guns and violence of regular Dark Champions campaigns, what you need is an "animated series" style campaign. 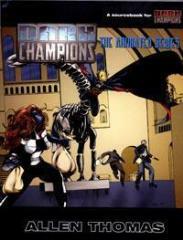 Dark Champions: The Animated Series looks at the less grim side of vigilante crime busting: caped crusaders with vigilante style but who refuse to kill; low-powered superheroes who fight street crime instead of world-threatening supervillains; "theme" villains with clever costumes and psychotic minds. • A discussion of the "animated series" subgenre in general, including advice about character creation, roleplaying, and gamemastering. • The Hudson City Knights campaign, in which costumed (but not superpowered) crimefighters take on a host of twisted villains who plan their crimes around strange themes or obsessions: Penny Dreadful, Adonis, Anagram, the Missing Link, Raptor, and more. • The Hudson City Powers campaign, which pits low-powered ("street-level") superheroes against similarly low-powered supervillains — costumed criminals like Carnivore, Guillotine, Rhapsody, Serpentine, and more. Featuring 29 new villains and six new NPC heroes, Dark Champions: The Animated Series is just the thing to bring even more fun and excitement to your Dark Champions games.